Every now and then Earth Mantra has the opportunity to release a classic of the ambient genre, and this is just one of those opportunities. It is with great pleasure that we welcome Geoff Nostrant of Silvercord to our roster of artists, with the re-release of his seminal 2001 album Bioluminescence. "Recording that album was a good memory. I wouldn't have thought so at the time of recording, though. I had moved away from my friends after graduating from the university in Michigan to fulfill an internship in Ohio. "I hated it. Although I tried hard in the internship, I had issues with some of the internship faculty. I would come home exhausted and the only way to vent was just sit down and record. focus and lose myself in the sound. Every night I came home to my acoustic and electric guitar, a Yamaha EX7 synth, and ancient recording gear (including a Tascam 8 track sync-cassette recorder, a Quadraverb GT reverb unit and my beloved Ibanez AD 202 analog delay unit). All that along with my wishes of transporting myself from a wicked world to that of another world. "The Bioluminescence album was created in about a week." It is always fascinating to us how circumstances translate into music. Sometimes if an artist is having difficulty in real life, their art will be stormy and dark, reflecting the great stress they are under. In other cases, however, real life issues can translate into some of the most uplifting music. Somehow the negativity and darkness is channeled in a positive direction, yielding work more beautiful and fulfilling than could be achieved otherwise. Apparently such was the case with this album. 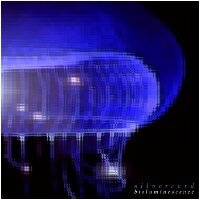 For Bioluminescence is indeed a work of sublime and inspiring beauty, a true classic of the ambient genre. We have been aware of this album for many years and never would have thought it might be releasable on Earth Mantra. So we were quite overjoyed when we found out we'd have the honor of bringing this glorious album to our audience. One of the great ambient releases ever, it is an essential download for the collection of any ambient music lover. I also sometimes experience the feeling of escaping into composing music, when such escapism is used as a barrier against the troubles of the exterior world. And usually such music turns out to be very immersive and inspiring, as is also the case with Silvercord's release. Very immersive sensibilities. I've deeply enjoyed this release for years. It's great to see it re-released on Earth Mantra to share it to a whole new set of listeners.